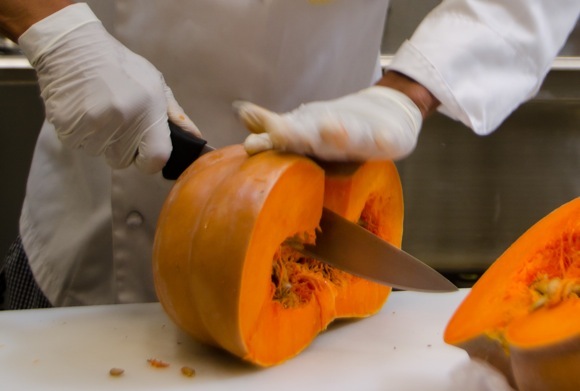 There’s lots of Fairy Tale pumpkin chopping going at Angel Heart Cakes. Pumpkin is just one of the seasonal flavors that also include spiced apple with cider glaze, cranberry-orange, and chocolate chip with ganache being offered by bakery owners Chris Rivera (pictured) and Debbie Umphreys in a variety of cake and cupcake sizes. Orders for Thanksgiving must be placed by Saturday, Nov. 19; (650) 363-2253. Chris and Debbie began baking their angel food cakes in 2009 and opened their own bakery at Marsh Manor in February. They’ve since expanded their baked good offerings and recently added Grab ‘N Go breakfast items.